The new Darth Vader series in a single word is awesome! Written by Charles Soule it starts off at the end of Episode III: Revenge of the Sith and launches into what will become Vader’s search for a new lightsaber. Normally I review comics an issue at a time but since I’m behind on writing reviews for the new Darth Vader series, here’s a two for one. First off, I am a big fan of Soule’s writing, how can you not be? He writes nearly 1000 titles a month! (Kidding, but it’s a lot.) Now he tackles Darth Vader and his quest for a new lightsaber. Now before I get too far into the story, it’s been mentioned to me by several Star Wars fans that issue #1 tones down Vader screaming “NO!” after learning of Padme’s death from how it was in the movie. Sure, the letter just wrote, “NO!” and not “NOOOOOOOOOO!” I can see how people might feel that way. It can be an interpreted by each individual reader and that’s what makes reading fun kids. But, I heard how it sounded in the movie and it’s still sticks in my head the same way when I read a “altered” version on the page. So to each their own. On with the review! After Vader falls to the floor in anguish the Emperor hits him with force lightening ordering him to defend himself with his lightsaber. Vader tells him it was lost in the battle with Obi-Wan. Needless to say the Emperor is not happy and so begins the history lesson of a Sith’s lightsaber and the hunt for a new one. We learn also why a Sith’s lightsaber is red, and so as not to spoil it for those who don’t know, it has to do with the fact that Kyber crystals are alive. The answer the Emperor gives is great and it’s well played out. Soule does a great job cutting between scenes of Vader and the Emperor and Mas Amedda giving a speech praising the Emperor while destroying all the lightsabers recovered from the dead Jedi. So why not just take one of the many lightsabers Mas Amedda collected? Vader knows full well that his new saber must be taken and not given. Vader is dropped off by the Emperor in the Mid- Rim to seek out a Jedi on his own and take the Kyber crystal for himself by defeating a them in battle. It’s a very interesting plot line since the Emperor knows it’s a formidable task since he and Vader have just finished eradicating the Jedi from the galaxy. Issue #1 ends with Vader recovering his ship that the Emperor left him and was stolen by unknown thieves. Plenty of action and Vader doing what Vader does best, plus Vader has an awesome looking ship! Great first issue and great dynamic artwork by Giuseppe Camuncoli. There is a back-up story in issue #1 and it’s a fun comical and very cartoony piece about Vader’s knee jerk reaction to his Generals failing him. Not mandatory reading but cute by writer Chris Eliopoulos and artist Jordie Bellaire. Issue #2 starts off on the Mid-Rim Jedi Outpost designated as “Brightome.” Clone troopers man the outpost with the task of making an inventory of what is described by clone trooper named “Kicker” as “Jedi junk.” Soule does a great job here making clone troopers relatable. They no longer feel like soldiers but more like disgruntled workers in a dead end job now that the war is over. Bemoaning the fact that survived so many missions in the war and now are basically doing data entry. They goof around with lightsabers mocking the Jedi and worry that the time of the clone is over now that they heard the facilities on Kamino are shut down. When Vader arrives the clones assume that the action has returned and they can fight once more. Vader does nothing to stop those thoughts by announcing himself. Instead he stays eerily quiet and ready for a fight himself. Soule adds a nice touch continuing to have Vader’s droid remind him over and over that he has the docking codes needed for a safe arrival. Vader just wants his weapons systems active. The action is very well paced and bears an the uncanny feel of when Vader first boards Princess Liea’s rebel ship at the beginning of Episode IV. Very well drawn again by Camuncoli as he leads you through the battle. Soule continues to put lightsabers in front of Vader and he can use them but he can’t make them his own. You can almost feel Vader’s frustration over this at times. From here Vader tasks his droid to search for any living Jedi. It’s very well explained through the dialogue between Vader and his droid how this is possible and it’s dramatic and lighthearted at times even for Vader. While the droid searches two clone troopers attack Vader, and again as not to spoil anything, it’s intense. In the end Vader’s full power is Kyber crystal clear. Vader’s only hope to find a living Jedi is to search data on any Jedi who took, what Vader calls, the Barash Vow prior to the purge. Vader goes on to explain that any Jedi pursuing the Barash has sworn off any activities related to the Jedi order. They are completely disengaged from anything but the Force. It’s a type of penance. Any Jedi who took this vow may have not gone into hiding after Order 66. I’ll leave the outcome for readers to experience (or until I review issue #3) but rest assured it’s well worth reading for yourself. By the end you’ll be chomping at the bit for issue #3. 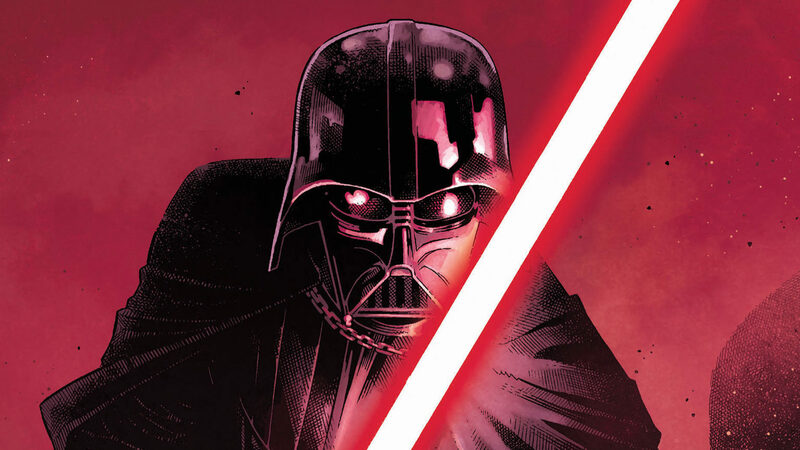 Darth Vader’s new series is off to a great start and Soule does a masterful job walking you through a lot of expositional dialogue and making it interesting and even exciting at times. Not a boring page to be found. Camuncoli art leaps off the page during battles and his take of Vader is powerful. As a Star Wars fan I learned a lot of new elements about the Jedi and Sith and Vader’s quest is sure to be an adventurous one in the hands of Soule and Camuncoli. Highly recommend picking these first two issues up! The most fearsome villain of all time returns with an all-new series! When Anakin Skywalker fell, both to the pull of the dark side and to the blade of Obi-Wan Kenobi, he rose back up, more machine than man. Having lost everything that was once dear to him, the former chosen one must take his first steps into a darker world… as Darth Vader, Dark Lord of the Sith! Join Vader as he learns a new way – the way of Darth Sidious and his newly formed Empire… the way of the dark side.